Totem poles standing in a forested setting. Pencil and watercolor by Canadian artist, Emily Carr. The colors in this month’s Art Bead Scene Challenge painting remind me of summer days – the earthy ochres and siennas, energized by that bolt of ultramarine. Those were the colors I pulled out of Brandi’s palette to create my focal. This collection of Hot Stix beads by Two Sisters Designs beautifully captures the organic shape of the totems and the background colors in Carr’s landscape. The heat patina on the copper leaf shape by Tanya McGuire adds the range of ochres from orange-red to yellow to brown. The layered focal hangs from a chain of peyote- and brick-stitched silver and bronze links and twisting strands of delicate copper, bronze, and silver charlottes. I had a day full of meetings yesterday, the perfect chance to take the necklace on a test drive to make sure the focal was well balanced and the necklace was easy to wear. I was early to my first event and spent a few minutes chatting with one of the leaders. She asked about my necklace, saying she was sure there must be an interesting story attached to it. 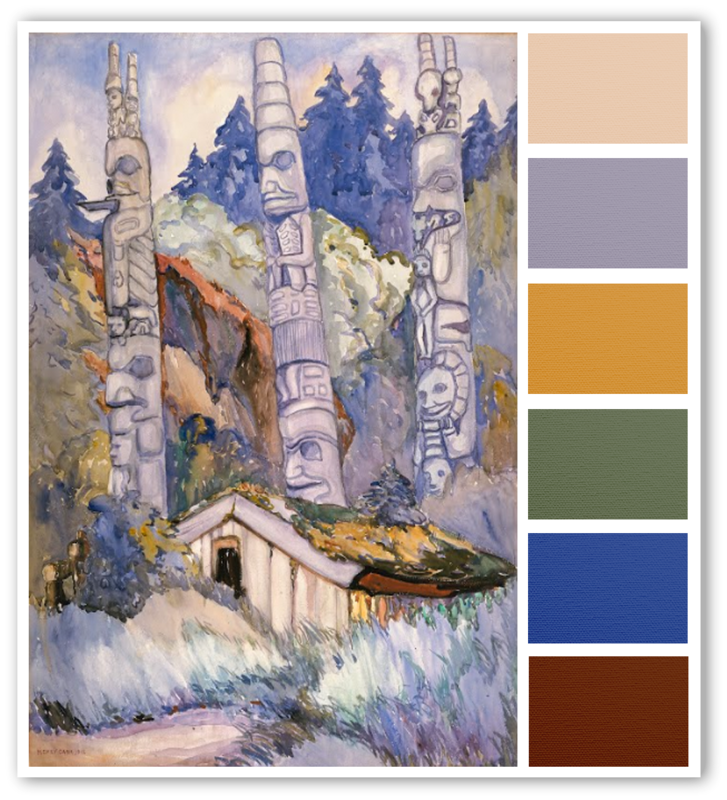 As I explained that it was designed around Emily Carr’s painting of the totems, she was surprised to learn that I had made it, but not as surprised as I was to hear that she not only was familiar with the totems, but had actually seen them! What are the chances…that I would be early…that she would ask…that a new friendship would be made! I would have gifted the necklace to her after our meeting, but hadn’t taken photos for this post yet. It’s packaged up for her now. After all, I have two more Hot Stix beads – I’m thinking I’ll use the lovely coppery one at the top of the photo, with a secondary focal in blue. Take a moment to click over to the Art Bead Scene Pinterest board to see all the designs posted for this month’s challenge. Lovely - the palette is gorgeous, your beads are gorgeous - nice! Great job on your beads and necklace! Beautiful! I love the chain and those wonderful beads . Beautiful necklace and it represents the photo well. It is always great to make new friends and what a lovely and meaningful gift to give. I love the organic look of this design and the totem focal! that is the perfect interpretation of the painting this month! I've been circling around this painting as it is exactly something that would inspire a design for me ... but alas this month does not have enough waking hours for me. I was really taken with the beaded squares for chain on the one side of your design ... what a wonderful pattern! I bet your new friend will love this gift and wear it often!